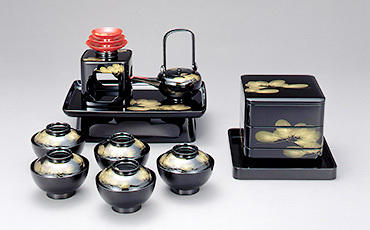 While we are eager to preserve the traditions of Wajima true lacquerware with its highly distinctive qualities, the inherent durability and beautiful finish that can be achieved are once again coming under scrutiny as “something new”. The making of speakers is just one new application of true lacquer techniques and others are bound to follow. To produce good quality sound, a speaker housing needs to be made of the right kind of wood to absorb vibrations, thus allowing it to produce nothing but pure sound. It is also said that it is important for the housing to be solidly built and to have a shiny exterior finish. Wajima true lacquer techniques seemed to fit the bill. The interior of the speaker has been left unfinished while the exterior has been thoroughly coated with true lacquer and given a glossy finish resulting in good quality sound and the distinctive look of a piece of Wajima true lacquerware. Collaborating with the Mile product design studio, we were able to produce a speaker which is fundamentally different. It not only produces excellent sound but also just asks to be touched and can be placed anywhere the user desires. The speaker won a Good Design Award in 2006. 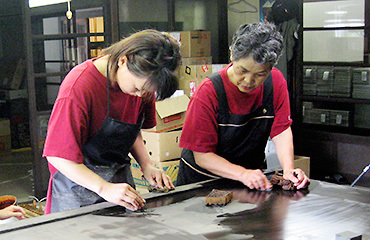 True lacquer has been used in Japan for many hundreds of years to coat and finish all manner of household goods. But with its warmth to the touch and modern character it lends itself as a finish to all kinds of fashion accessories, interior items as well as such things as guitars. 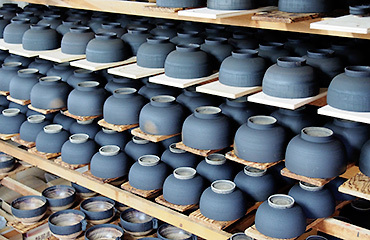 We are eager to collaborate with designers as well as individuals from all over the world to develop new and exciting uses for Wajima true lacquer. If you have an idea, we have the skills and techniques to bring them to reality. Our aim is to spread the word about just how good true lacquer can be.